VideoCAD Plugin for Google SketchUp allows to import 3D models and scenes from Google SketchUp. Choose lenses and positions for CCTV camera installation. Choose IP cameras with optimal resolution (number of pixels). Visualize camera pixel density (spacial resolution) and field-of-view size on the location plan. Use CAD interface for camera placing. Place cameras on prepared backgrounds. AutoCAD *.dwg, AutoCAD *.dxf, *.bmp, *.jpg formats are supported. Obtain a drawing with horizontal projections of site layout with camera images, calculated view areas, and with coordinate grid to be used in graphical path of the project. Export the obtained drawing into any of the following formats: *.bmp, *.jpg. Starter II version allows to save the drawing in the Graphics window with resolution exceeding Windows screen resolution. Export the Camera list with most important parameters to MS Excel, MS Word and other software. 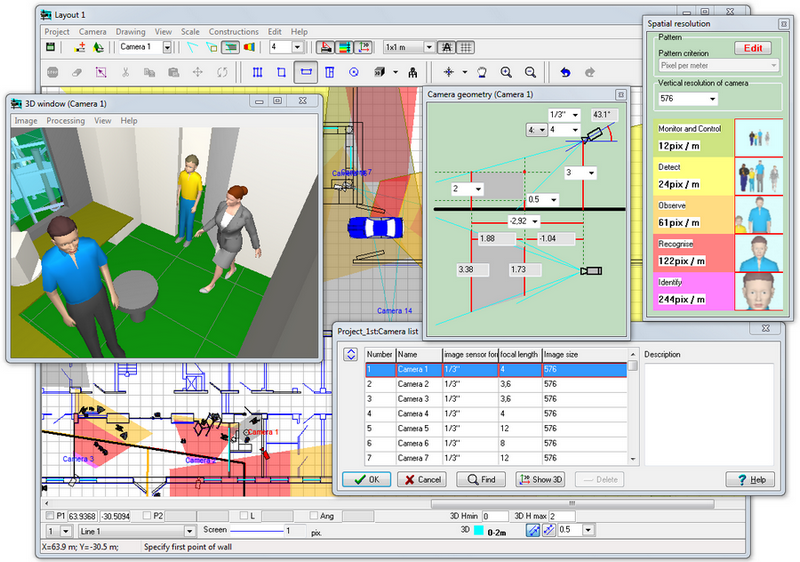 Construct three dimensional models of real scenes. Use many 3D models (people, cars, bus, furniture, turnstile, tree, grass). You can add other 3D models from 3ds max and Google Sketchup. VideoCAD Plugin for Google SketchUp is a part of the kit, allows to import 3D models and scenes from Google SketchUp to VideoCAD. IP Camera CCTV Calculator is a part of the kit, allows to calculate required bandwidth and disk space for IP camera installation. This calculator allows to take into account up to three digital flows, use data from camera manufacturers, it can import data from VideoCAD, export to Excel and has many other options.